The Kansas State University Sales Team beat out a field of seven other universities to win the University Champion award at the 2018 Arizona Collegiate Sales Competition. Hosted by Arizona State University, Feb. 23-24, in Tempe, Arizona, the competition was an invitational-only event consisting of three sales role-play scenarios. 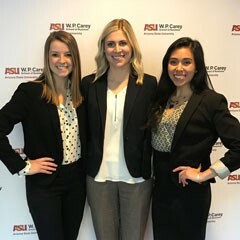 Making up the winning team at the contest were Abbie O’Grady, sophomore in marketing, Overland Park; Emily Voris, senior in animal sciences and industry, Atwater, California; and Valeria Rubio, junior in international business and hospitality management, Grand Island, Nebraska. In addition to their team championship, O’Grady also won second place individual and Voris took home third place individual out of a field of 30 student competitors. Sales competitions allow students to test their selling skills against their peers from other universities with a focus in sales through role-play scenarios, case competitions and speed selling. Marketing instructor David Lehman is the head coach for the K-State Sales Team. Kellie Jackson, program associate, coached and traveled with the team for the Arizona Collegiate Sales Competition. The K-State Sales Team is housed in the College of Business Administration’s National Strategic Selling Institute, which has been named one of the top sales programs in the country for six straight years by the Sales Education Foundation. Students can earn a certificate in professional strategic selling from the National Strategic Selling Institute, which is open to all majors at the university. The certificate program introduces students to the fundamentals of sales and, through the innovative curriculum and sales labs, allows students to develop the skills needed to be successful. Beginning in fall 2018, K-State will become just the 19th university in the U.S. to offer a sales major. For more information on the National Strategic Selling Institute, please contact kstatesalesprogram@k-state.edu.